Jane MacNeill was raised in Aviemore and educated at Edinburgh College of Art. The recipient of several notable awards for painting and draughtsmanship, her standing as an artist is now well-established with a consistent body of work that attracts a loyal following, I’m told. A regular draw when shown at the Kilmorack Gallery in Beauly, her landscape work is subtle and easy on the eye – tranquil to the point of stilling the maelstrom of life even – and in person she carries herself with a gentle demeanour, too. There are times when one meets an artist, sees their work, and feels a mismatch between the two, a disjuncture of some kind between creator and that created, but not so in MacNeill’s case. Talking to her about the current installation of her work in the project space known as The Room; a discrete curated area set up as an adjunct to An Talla Solais’s main gallery space in Ullapool, her tone is thoughtful and reverential. Appropriate really, because the work we are talking about is a series of icon-like pictures of birds; subtle, compositionally grounded, and powerful despite their diminutive size. Though she doesn’t say so on my first meeting with her, from her writing I later learn that the paintings we are looking at together are arrived at from a feeling of intensity in the eye contact that she makes with the wildlife she encounters and later paints. The personality of the fauna she meets with can, at that moment of eye-contact, become “large enough to fill an entire landscape,” she says, and to condense that vastness of experience in the natural world and present it within such modest dimensions (typically as oil on gesso panel, or board, and sympathetically framed in a way that enhances what she alludes to) is no mean achievement – the intensity referred to becomes all the stronger for it. Jane MacNeill, Herring Gull. (Oil on Board, image courtesy the artist/An Talla Solais Gallery). The backstory to all of this she has appropriately documented with few words: “As a young artist I was deeply affected by the symbolic use of colour and gold leaf in religious and devotional art which I encountered on travels to Spain and Italy. This had a profound and lasting effect on my work and combines with my continuing fondness for minimalism. I compulsively simplify, smooth surfaces, economise on detail, and allow only one shape or subject to emerge in each painting, striving for a visual simplicity.” This, of course, is common to devotional work such as the painting of religious icons, and I have felt a similar intensity that I find in Jane MacNeill’s work when viewing icons in Orthodox churches in the Balkans, too; but a herring gull? Frequently seen as a scavenger with a rapacious appetite, although the herring gull has been the subject of rigid protection, latterly it has been exposed to measures taken to regulate its numbers due to the damage it is said to be doing to the habitats and nesting sites of other species. A bird about which there are mixed feelings, clearly, MacNeill’s painting of the herring gull cuts through human interventions of this kind to see the herring gull in a new light, allowing us to discern the individuality of a single bird, rather than view it according to its scientific classification that dissuades such ways of seeing. 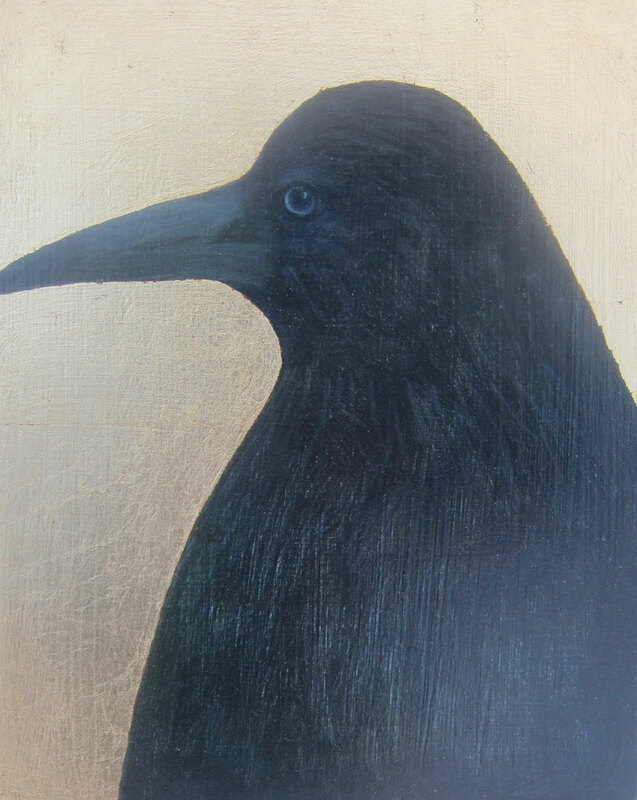 Jane MacNeill, Jackdaw, (Oil on Board, image courtesy the artist/An Talla Solais Gallery). As our brief conversation progresses onward to the exchange of business cards (hers subtle and soft to the touch, mine brashly informative and bullish by comparison) I declare that “I particularly like your hoodie,” referring to the hooded crow that I think I see. 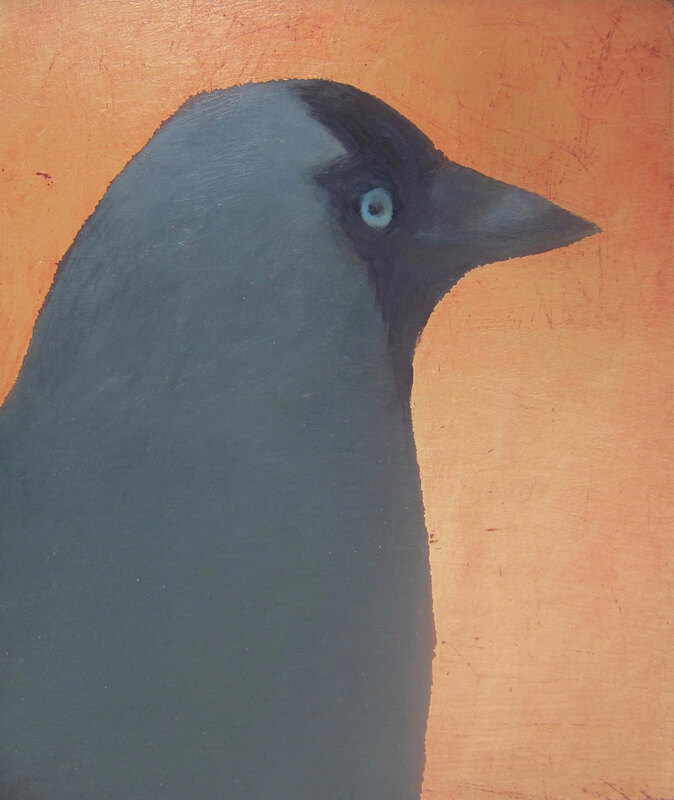 Only after MacNeill moves on does artist Peter White tell me in a whisper, “that’s a jackdaw, not a hooded crow.” I like to think I know this (in fact I know I do) so why did I refer to it by another name? Obviously a jackdaw, one of the most intelligent of the Corvidae and capable of identifying individual people on sight, I fail to identify MacNell’s fine specimen and my embarrassment kicks in. Then I recall a conversation had recently with somebody close to home, about the shooting of ‘hoodies’ on the gaming estates, and realise that I’m rather preoccupied with their plight at present and they are very much in my mind. My faux pas set to one side, I go back for another look while the artist is absent, and on second viewing I have the space to myself. I’m not sure who came up with the idea for this ‘project space’ as I refer to it, but The Room is a wonderful concept, lending itself well to the viewing of such intimate work as this. While at present the main gallery is given over to the Royal Scottish Academy’s ‘Winter Flowers-redux’, an exhibition reformatted as a spring exhibition that I have already written about, The Room works like a magnet, or as if it possesses its own gravitational force, drawing visitors into a more personable space that is wholly sympathetic to MacNeill’s discrete icons. There’s another herring gull here and a lapwing, also, along with an oystercatcher, a robin, and a rook that holds its own in the space very well. Each of these (and there are others) are demanding of our attention in their own right, and with works hung in such close proximity, it occurs to me that the real success of what MacNeill is showing currently is that, on viewing each of these paintings, one finds oneself focussing on just one picture at a time, not viewing them all as a single body of work as is often the case: it’s a moment of clarity for me – to realise, that is, that each painting commands a similar intensity of meeting that MacNeill says she experiences in the field. 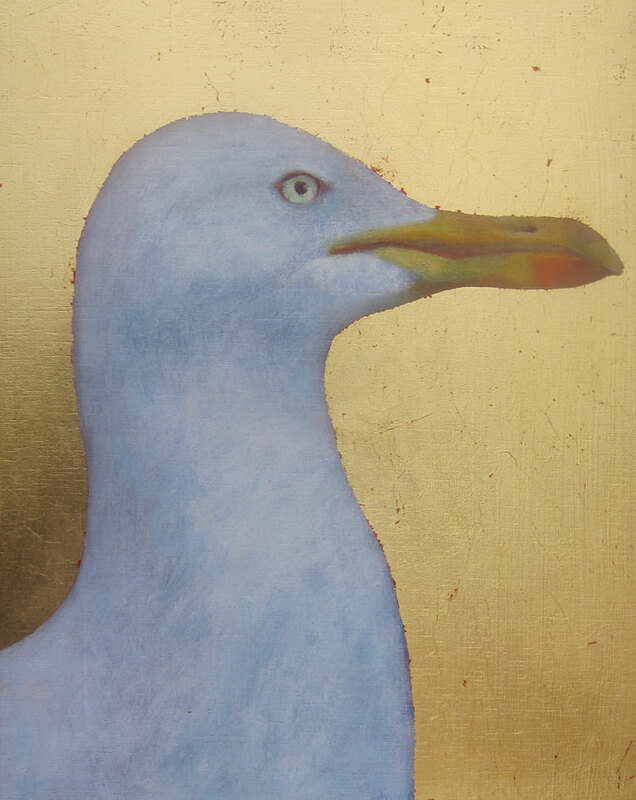 Jane MacNeill, Herring Gull II, (Oil on Board, image courtesy the artist/An Talla Solais Gallery). Spring is, of course, a time when many of these birds show themselves at their very best. The lapwing’s characteristically giddy and winding flight is much in evidence in late-March and early-April, and spring is the time of the oystercatcher’s loud piping trills as they perform their courtship displays, running beside or behind each other for hours on end before breeding takes place and they stake out their territory for the season to come. Jane MacNeill, Lapwing, (Oil on Board, image courtesy the artist/An Talla Solais Gallery). Rooks, too, have their own behaviours that are unique to spring, but the rook that MacNeil has on display here is one which we see not so much as the rook-of-the-field, with its rolling gait and baggy britches that distinguish it most from the crow, but a rook-of-the-studio, posing for its portrait. It is as elegant and as refined as any renaissance sitter, and probably a lot better looking than some human specimens that have sat for their portrait over the centuries. And yet, all of these birds that MacNeill has on show seem to also have what might be considered as some human qualities, too – imbued upon them by the artist perhaps? Or is it the other way round? As I leave The Room to rejoin the exhibition in the main gallery space, I observe my own rolling gait as I move among a modest throng of visitors, and recognise myself as one of a species no more or less social than rooks themselves. A loud rasping squawk goes up, and fills the room. Are we a parliament of rooks here? Is that a parcel of oystercatchers I can hear trilling away at the far end of the gallery? Credit to MacNeil that she has me questioning my own species after viewing those she has observed. Jane MacNeill, Rook II, (Oil on Board, image courtesy the artist/An Talla Solais Gallery). Jane MacNeill’s work can also be viewed at the Kilmorack Gallery.